Philips 40PFT6550 review | What Hi-Fi? Philips hasn’t had a very good run of late. Its past few TVs have been serviceable, but nothing special – not enough to give the very best a proper challenge. And unfortunately its latest effort, the 40PFT6550 seems to be providing more of the same. It’s a case of close, but not quite. 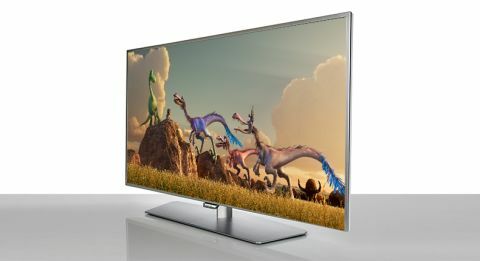 This 40in Full HD LED TV sits in the middle of the Philips range. It comes packed with a good amount of tech and supports active 3D, although no glasses are provided. As with every Philips TV we’ve seen this year, it runs on Google’s Android TV platform. Around the back you’ll find a generous four HDMI inputs and three USB ports. It also has Philips’ lovely Ambilight technology on three sides (left, right, top), with strips of LEDs projecting light on your wall. Ambilight is as dynamic as you want it to be – you could have a solid, non-moving colour, or the lights can react to whatever is on screen. This has the effect of expanding the image to your peripheral vision, creating the illusion that your TV image is a lot bigger. It is designed to decrease eye fatigue and increase the feeling of immersion, and we really like it. Another Philips trademark is the two-sided remote control, normal on one side but with a full QWERTY keyboard on the other. It speeds up the laborious task of entering email addresses and passwords. Sadly, the time saved there is wasted all over again in the menu system which is plain annoying. It takes 15 clicks just to get to adjust the brightness. You’ll need to dive deep, as it’s hidden under layers of sub-menus. Of course, you’re likely to do this once and forget about it, but this is a long-standing problem and we cannot believe Philips has let it go on for years. The TV is sluggish too, with some button presses taking seconds to have an effect. Thankfully, the picture makes up for the system performance to a degree. We like the textures offered, which is sharp without exaggeration – this is definitely sharper and more subtle than the Finlux 43UT3E310B-T. The backlight is encouragingly uniform too. We like the level of contrast, which demonstrates a fine ability to juggle bright and dark – although we’d like the blacks to go a little deeper. At both extremes, there is a good deal of detail, although the blacks tend to betray a bit of noise. The Panasonic TX-50CS520 achieves deeper, cleaner blacks with ease. It also has more accurate colours that make the Philips look a little green, even with some adjustment. Motion handling is acceptable. Turning off all motion processing and the Philips struggles with slow, smooth pans – this can be fixed with motion processing set to minimum, but we feel even this looks unnatural and overprocessed. Sadly, there is no compromise. As for smart content, Google’s Android TV has much potential but is a little sparse for now. You get Google Play plus Netflix, YouTube and BBC iPlayer. We’d like more, however. This is a decent effort. But there are things that need improving, such as the picture and the interface, which face tough competition. Until then, we’ll file this under ‘decent’.